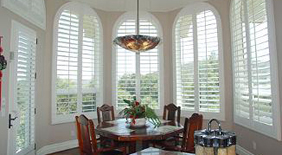 Nothing says elegance and beauty like interior shutters from Duke Shutter Company in Acworth, GA. These interior window shutters are fully functional, like outdoor shutters, yet they dramatically improve the look of your indoor living space. We offer our interior shutters in many sizes and styles, depending on your needs. Leave the shutters open to provide full lighting for your rooms. If you'd like, you can close them for privacy or when the sun is heating up your home. 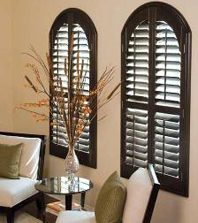 Whatever your needs, our custom interior shutters offer an easy way to add value to your home. Make things easier on yourself when you're trying to install interior window shutters. The team at Duke Shutter Company in Acworth, GA, has been providing window blind installation services for many years. From creating the blinds to hanging them perfectly, we ensure that you are perfectly satisfied with the finished product. The wind, rain, and weather elements can't touch your interior window shutters. In fact, you'll enjoy them for a lifetime. Fully functional and customizable, they add a great aesthetic look to any living space. Our window shutters company in Acworth, GA, fabricates them to your specifications and installs them as well. Use them as blinds or open them up completely. Whatever you want, we'll create your custom interior shutters to match your specifications. Best of all, they're easy to maintain. A light dusting every now and then keeps them looking beautiful. Shade yourself from the sun with custom window blinds and shutters. All we need are the measurements and your design ideas, and then we'll fabricate the perfect custom window blinds for you. If you'd like, we also proudly offer free in-home estimates as well. There's only so much that curtains can do to enhance your rooms. While they may offer color, the simply cannot compare to custom window blinds and interior shutters. Allow our Acworth, GA, team to provide creative and affordable ways for you to make a beautiful and bold statement. Contact us to request a free estimate for interior window shutters in Acworth, GA, that create elegant appeal in your home. We proudly serve customers in Acworth, Kennesaw, Canton, Woodstock, Marietta, Smyrna, Dunwoody, Johns Creek, Alpharetta, and Roswell, Georgia.